The UK trailer for What If has been released by Entertainment One via MSN Movies UK which you can watch below plus the UK TV spot. And second the release date for the UK has been changed: From the earlier announced 22nd August to Wednesday 20th August. 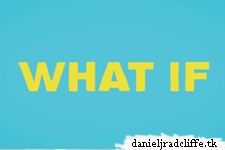 Daniel Radcliffe stars in What If, a hilarious new comedy about bad relationships and friendship. The film also stars Adam Driver, Zoe Kazan and Rafe Spall.